We are experts at creating a product feed of your inventory. We also specialise in creating affiliate and Custom feeds. We ensure all products are set up and well optimised for relevancy and maximum sales. We audit the ‘feed’ regularly for feed optimisation for maximum product visibility. Ongoing campaign performance and management, with weekly reports ensure all inventory is fresh, in-stock and high margin/best selling products pushed to the forefront. Our SLA’s won us Best B2B UK Service Agency 2017. 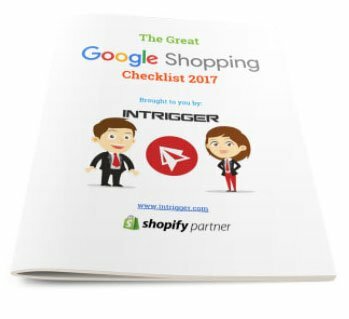 Download Your Free Google Shopping Checklist Now! Call us, email us at hello@intrigger.com or fill out the form to request more information or schedule a meeting.